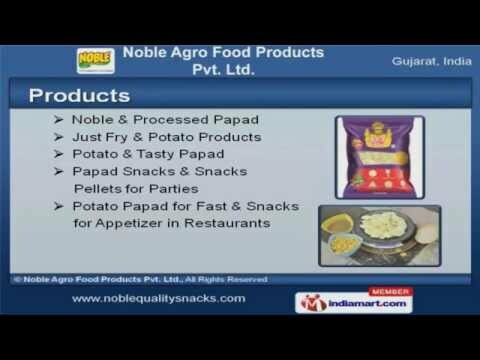 Welcome to Noble Agro Food Product Private Limited, Manufacturer and Exporter of Papad Snacks and Snack Pellets. The company was incepted in 2007 at Ahmedabad. Our Ethical business policies and Stringent quality checks helps us to grab maximum customer satisfaction. Superior quality products, hygienic packaging and Client friendly payment options make us the preferred supplier in the industry. We offer a diverse range of Processed Papad, Just Fry and Potato Products. Noble and Processed Papad offered by us are widely appreciated in the market. Our Just Fry and Potato Products are in huge demand across the global markets. We also provide Potato and Tasty Papad that are available at market leading prices. Papad Snacks and Snacks Pellets for Parties are some of our best selling products. We are known in the industry as the manufacturer of Potato Papad for Fast and Snacks for Appetizer in Restaurants.